Dec. 8th, 2017: All the heavy stuff delivered into my garage, less than 48-hours after I ordered it delivered on time. The delivery guys were efficient and friendly and took pride in their work. Feb 5th, 2019: Best price and service in city. I ordered dry wall for our basement and it was delivered right into basement. Price is way cheaper then other suppliers and retailers. I strongly recommend this company. July 5th, 2018: Easy, Fast, Cheap price, Clean and Polite. I ordered online and request next day delivery, got email replied in 10 mins saying everything ok! They arrived on time next day, put all drywall in basement carefully, they even stack all 58 drywall properly, superior service! Aug. 20th, 2018: I ordered drywall using the online form and asked for delivery the next day. They responded to my emails within minutes and confirmed they could meet my delivery needs. The delivery itself was done with a crane and three employees. It was quick and easy and they were sure to go over my order and make sure I had everything I needed before they left. In total, I only paid $60 more for 65 sheets of drywall than I would have at Home Depot (and would have had to haul them in myself). I am very, very happy with the service I received and their competitive pricing! I would use this company again! Feb. 13th, 2018: This is the second time I have used 1-800 Drywall so you know the first time went well! This company makes you feel like they appreciate your business. The On-line chat resources were prompt and pleasant to deal with. I put in a last minute order for delivery and they met it. The driver phoned to let me know when they would be there. It was a very cold snowy day, but the two lads working on carrying in all that drywall were cheery and neat. They made sure to stay on the covered floor, stacked everything nicely in the basement floor and were on there way. Mar 16th, 2019: We were searching for a company that would deliver our drywall and supplies but if you are outside of a major center the price for delivery is usually crazy. We priced out everything we needed and it was very comparable to the big box DIY stores and 1-800 drywall delivered it right into our basement. Very easy to work with on our order and the delivery crew were so efficient and a pleasure to work with. 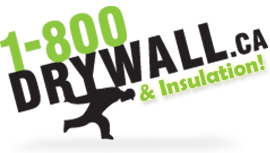 We would definitely recommend and use 1-800 drywall again!